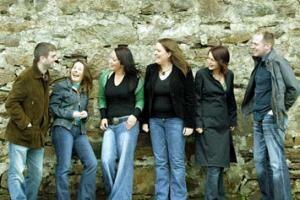 Arcanadh are a six piece traditional Irish vocal group formed in the summer of 2002. They initially came together to tour America and perform in the Interceltic festival in L’Orient France. Hailing from the four provinces of the country, Arcanadh boast a wide variety of instruments and unique vocal harmonies. Their songs range from traditional sean-nós to contemporary arrangements of age-old songs and new compositions, many of which are arranged in harmony for six voices. These voices are accompanied by a wide variety of instruments such as the harp, fiddle, mandola, piano, guitar, whistle and banjo while others are more acapella style. Four of the members of Arcanadh are currently living in Donegal. Colm Breathnach (An Rinn Gaeltacht, Co. Waterford) and Sinead Gibson (Gortahork, Co. Donegal) have recently married. Mags and Martin Gallen brother and sister, are originally from Castleblayney, Co. Monaghan. The remaining two members, Maria Corbet (Palmerstown, Co. Dublin) and Fiona Walsh (Bohola, Co. Mayo) are currently residing in Dublin. Since Arcanadh’s formation in 2002, they have toured extensively to such places as Taiwan, Romania, America and France where they were awarded the Dagan trophy in the L’Orient festival for the best traditional group in August 2002. Arcanadh have won the Irish Music Magazine award for best newcomer 2005 and have been nominated for the Celtic Fusion Awards for 2005 as Best Newcomer in Irish Traditional music. Arcanadh have been very successful on the Irish Music Festival or Fleadh circuit in Ireland and in France with awards for their singing and playing. Irish Music Festivals are an important element in the Irish Tourism calendar and like most World Music or Celtic Music Festivals they attract the best of musical talent from across the continents in competition. Having won first prize in L’Aurient Music Festival in France they have demonstrated their mix of music and voice to be Celtic and Sean Nos to the extreme. Playing Guitar, Piano, Mandolin, Fiddle, Harp, Tin Whistle, Flute and Bodhran they can fill a Fleadh anywhere. © Wren Records. All Rights Reserved.